On 11 - 12 July 2015 Alexey Isakov, Instructor of International Wing Chun Organization - IWCO, conducted seminar for students of IWCO - Saratov school dedicated to exams for levels 1, 2, 3 of the International Wing Chun Organization program and held the masterclass for level 4 of Cham Kiu. Congratulations to the students who successfully passed the exams! Address : Flat 812, 8th Floor, Yuen Fat Industrial Building, 25 Wang Chiu Road, Kowloon Bay, Hong Kong (within 5 minutes walking distance from Exit A of Kowloon Bay MTR Station). Directions of walking from from MTR: Turn right at Exit A and pass through the shopping mall (Telford Plaza), then via the flyover to Telford House. After riding down the escalator at Telford House, walk straight. The master class was conducted by IWCO Instructor Eugene Paramonov. 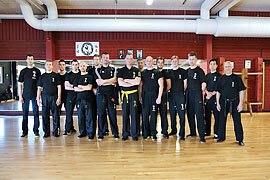 The seminar was conducted by Sifu Anatoly Beloshchin. IWCO students meeting in Stockholm (Sweden). IWCO-Sweden and IWCO-Russia students meeting was held August 24-25, 2013 in Stockholm (Sweden). The meeting included: Chi Sao between students, IWCO master class and excursions. IWCO thanks to Instructor IWCO-St.Petersburg Osman Dinaev and Instructor IWCO-Sweden Robert Kenneryd for their help in organizing this meeting.